Has there ever been a better pantomime villain in football? 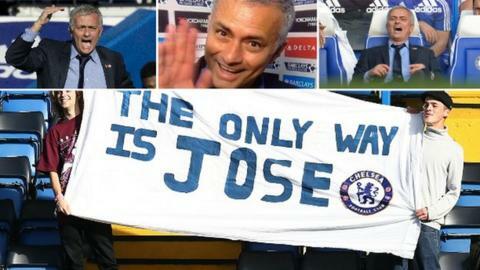 As the form of Jose Mourinho's Chelsea side hit a new nadir with a 3-1 defeat by Liverpool, social media took great delight in mocking the under-pressure Blues boss. But only around 3,700 tweets, of around 200,000 which were sent, contained both the words 'Mourinho' and 'sack'. Does, deep down, the public want to keep a man who tends to create talking points? Maybe. But even so, no one said they can't have a giggle. By 16:00 GMT on Saturday the term 'Chelsea' had been tweeted 578,000 times - the leading worldwide trend - while there were roughly 200,000 tweets sent containing the term 'Mourinho' between midday and 15:00 GMT. Golf's world number three Rory McIlroy simply posted, #TaxiforJose. Within three hours it had been re-tweeted more than 2,000 times, gaining traction as far afield as Melbourne and Jakarta. Manchester United fan Rory McIlroy started the mischievous hashtag "TaxiforJose"
Popular YouTube personality and West Ham fan Spencer Owen wrote: "Chelsea should have got rid of Mourinho weeks ago before Big Sam joined Sunderland! He was their best chance of staying up this season!" Meanwhile, cartoonist Omar Momani was quick to link a Halloween nightmare as he depicted Liverpool manager Jurgen Klopp arriving at Mourinho's home. Everton fan Andy tweeted: "Poor Jose, he was just fully committed to being Brendan Rodgers for Halloween, and now he's going to lose his job over it." And Twitter user Kobi the Key opted for some lyrics from the 2003 R Kelly hit 'Ignition'. His adapted lyrics read: "It's the remix to ignition. The Mourinho Edition. Bought Falcao to spite Man U. Now I'm in 15th Position." Popular website Bleacher Report simply used the following image along with the words: "Chelsea FC—The Sinking Bus." Of course, after such a humbling defeat, with a pack of baying journalists ready to fire questions, Mourinho's post-match news conference suddenly became a must-see event. In it, the 52-year-old - charged by the Football Association with misconduct earlier in the week - refused to answer questions about key incidents in the game on the basis he may be punished again. His guarded nature led to the hashtag #Nothingtosay being used just over 6,400 times in around 90 minutes. Paul Hayward, chief sports writer for The Telegraph, tweeted: "Chelsea's players are the best in the business at seeing off managers. Nobody could say they fought to keep Mourinho today."